It's time for a new challenge at Miss Kate Cuttables. 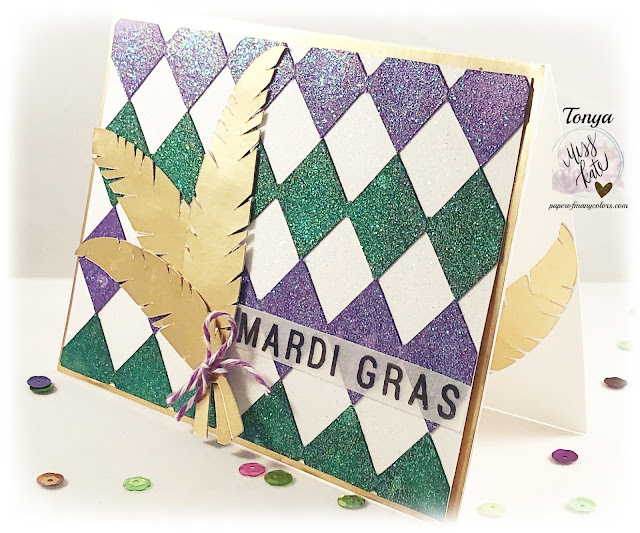 The challenge theme is Mardi Gras. 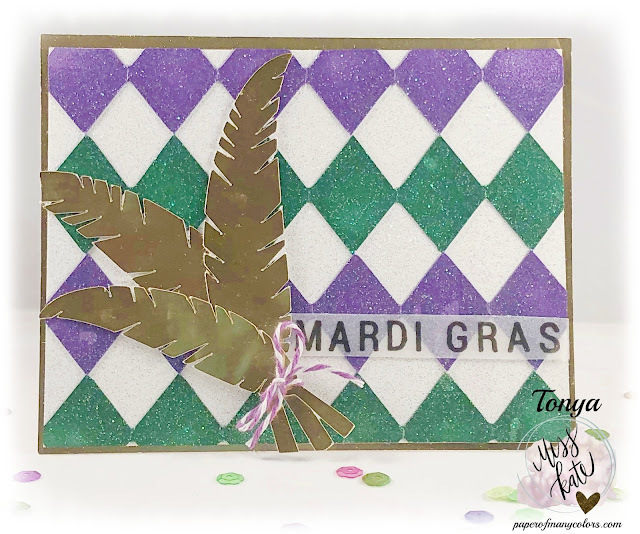 When I think of Mardi Gras, I think of flashy golds, purples, and greens. For the challenge I created a card to celebrate. 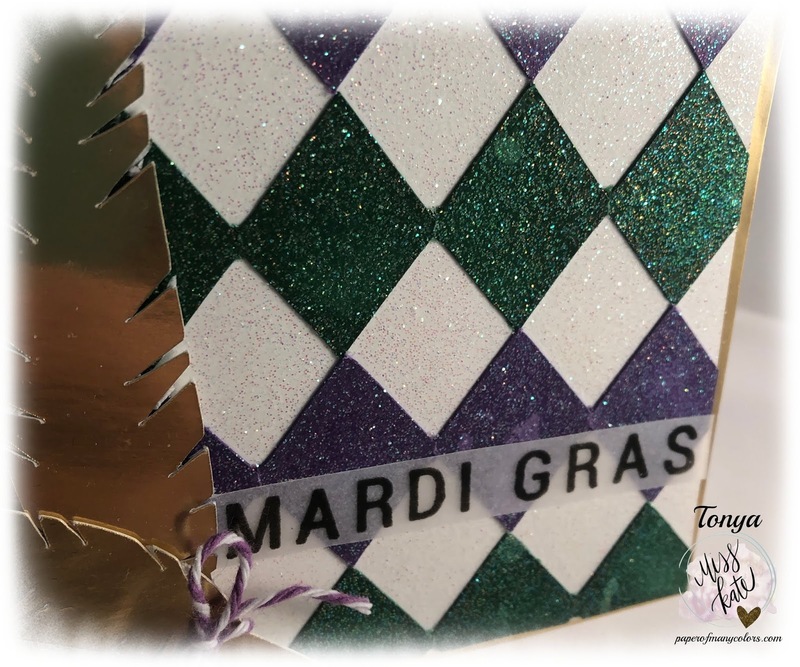 For my focal panel, I used the diamond pattern from Miss Kate's Spring Borders Set cut out of purple and green card stock. I adhered that to a white panel. The panel was a bit plain, so I embossed it with holographic embossing powder. 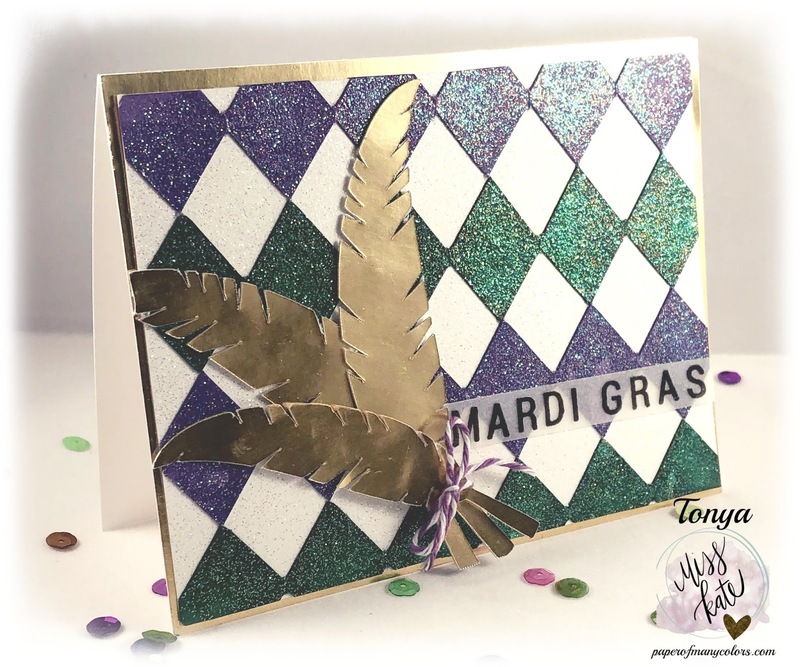 I cut some feathers from Miss Kate's Feather Set from gold card stock. They were adhered with glue dots. And accented with some twine. 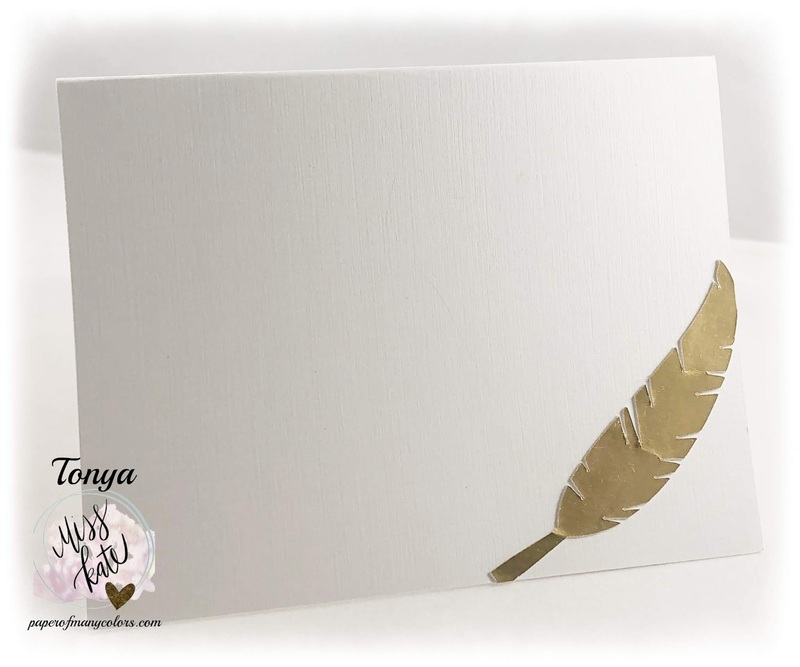 The panel was then adhered to a gold panel, same as the feathers card stock. The sentiment was created using an Ellen Hutson Alphabet stamp set and heat embossed on vellum. For the inside, I added a gold leaf. The card base is a white linen paper. It's my day to post over at Miss Kate Cuttable's blog. My DT project is a tree top for our Valentine's Tree. 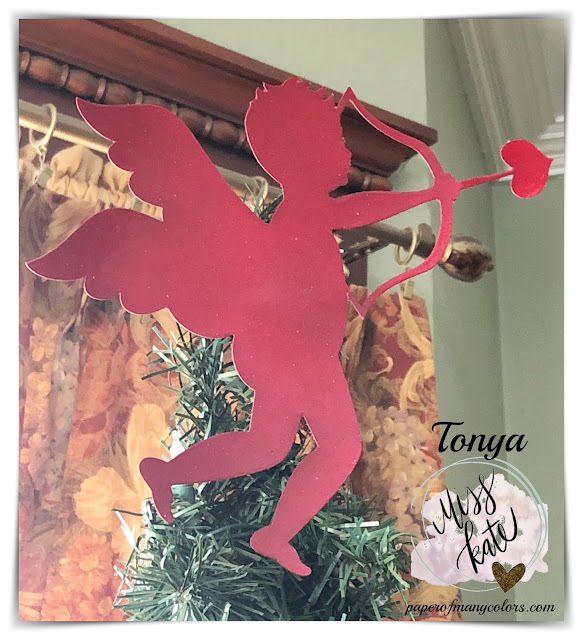 We were away from home over the holidays with no room for a real tree or any big decorations..so I told hubby that I was going to have a Valentine's tree. I put the tree up but didn't have a topper. With all the weather that we have had here in the midwest, I haven't gotten to any stores to see if there is anything of use. So I decided to make something. Hubby wanted a cupid so off to Miss Kate's files I went. And I found Miss Kate's Cupid cut file. It was perfect. I cut the file from WPlus9 Cupids Bow Card Stock (which is not available any more). It was a perfect match for the tree decorations. Then I clear heat embossed the whole cut. You can see the shine in the photo below. To attach it the tree, I hot glued a red pipe cleaner to the back. I know that this project seems a bit simple..but it took a lot of trial and errors to get this one. For example, I attempted to create a glittered version, but it was a total fail!